Do you like clicking things and building your own civilization? CivClicker is a new browser game (based on Cookie Clicker) that lets you do just that! Click to gather each of three resources: food, wood, and stone. 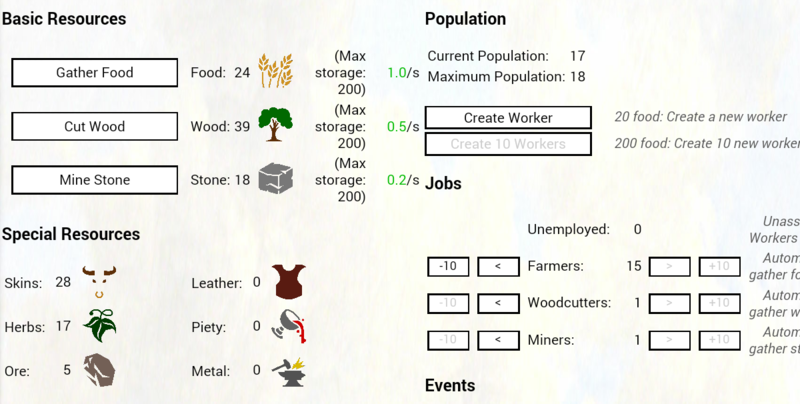 Once you have a shelter and enough food, you can start creating workers to do the clicking for you. You still need to manage the civilization, though, by hiring specialized workers, creating buildings, purchasing upgrades, worshiping a diety, raiding other civilizations, and trading resources. Randomly-triggered events like wolf/barbarian attacks and disease keep you on your toes, too. Don’t Google CivClicker if you value your free time. Of course, I couldn’t resist. 😛 For being a simple clicking game, it really draws you in. It doesn’t work well on tablets, though; while playable, the text overlaps and gets hidden under buttons. Want to give it a try? Play CivClicker!